These scallops were an instant hit one Saturday night. It took me almost fifteen years of making this quick and easy dish to actually write out a recipe. I tested it out recently and Larry gave it his usual “double thumbs up”. Shop at your favorite seafood market and use good sherry in the sauce. Note: my scallops were dry-packed from the East Coast with muscle pre-trimmed. 1. Zest the lemon and set aside. 3. Heat 2 tablespoons butter in large skillet over medium heat. Sauté scallops for one minute per side, seasoning with salt and pepper. Remove to a dish, squeeze with lemon juice and cover. 4. Heat remaining 2 tablespoons butter in same skillet. Heat stock for one minute in microwave. Add flour to hot butter and cook, stirring, for a minute or so. Whisk in hot stock. Mixture will thicken quickly. 5. 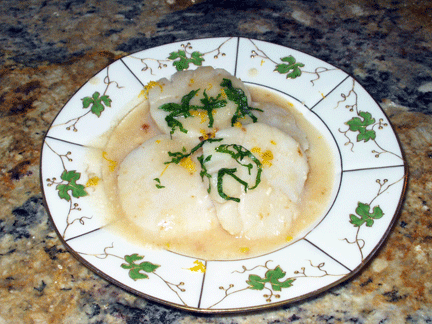 Add sherry and parmesan to sauce, stirring, then return scallops and their juices to skillet. Cook over very low heat for 2-3 minutes. Garnish with zest and parsley. These sound so elegant and luxurious, yet so easy to make. No wonder they won Larry over! I agree with Larry…two thumbs up!!! I love the addition of the sherry to the dish! This looks so good!! And I love the story about Larry helping you preserve your bungalow. It’s my favorite architectural home style. He transformed the house – well, our contractor helped some too ! OMG, Now that is what I call courting! Doing handy work around my old house would getting me cooking with gas. Love the scallop recipe. As always, fabulous! He’s one of those guys who always likes to be busy doing something – and he’ll be back there soon. Now that I’m older, I appreciate a handy guy. Give me a man with a toolbox any day! Your scallops look divine. And I’m so delighted that Larry is on the mend. Love to both of you. Recipe looks awesome and I’m looking forward to June when you can tell me the whole story. And for the record, Craftsman bungalow is my favorite style of architecture, too! You just posted on FB that Larry is back in the hospital–I hope by now everything is OK and he’ll be on the mend soon. Big hugs. Thanks, they are a favorite treat at our house. Liz, I hope I get the opportunity to cook this for my sister-in-law someday. She is a great fan of scallops and very particular about them. I hope she enjoys them, Jean – we ate early and the old recipe did not fail.